As a child, Domenico Bei fostered his love of nature by exploring the rocky slopes of Monte Nerone in central Italy. He picked up souvenirs on many of his journeys around the mountainside and after a few years of exploring, Bei, a native of the small Marche village of Apecchio, had acquired an impressive collection of interesting and beautiful rock formations. It wasn’t until years later — after much more exploring and research — that Bei came to realize that his personal collection of natural treasures held vital information about Italy’s past. What Bei believed to be interesting rocks were actually fossils that had been resting on Monte Nerone for millions of years. Thanks to Bei’s careful handling, the fossils remained intact. The pieces are now part of a larger collection of fossils that are on display in a museum in Bei’s home town. 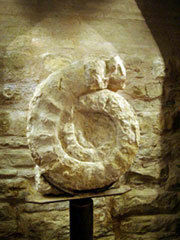 The fossil museum is located within the walls of the Ubaldini Palace, a medieval castle that was once the home of Apecchio’s founding family. Bei holds the official title of museum curator as he found and examined almost all of the pieces. The stone walls and floors of the fossil museum were once a part of the Ubaldini family’s dungeon but now the ceilings in the frigid room are lined with spotlights projecting a bright aura in the underground museum. Unlike intricate exhibits that can be found at larger museums, the displays at the Ubaldini Palace appear simple at first glance, but actually contain fascinating and one-of-a-kind fossils that help to paint a clearer fresco of this ancient land’s history. Rows of rectangular glass cases lead spectators from room to room. Hundreds of stone slabs fill the cases, each containing an imprint left behind by an ancient creature. Bei’s fossils look like giant white spirals, reminiscent of snails or hermit crabs that can be found near the ocean today. 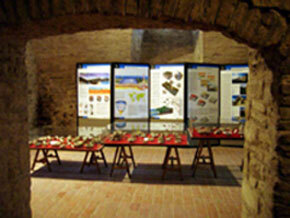 Visitors learn that this is because the Marche region of Italy was once completely flat and submerged beneath the sea. Sea creatures that thrived during the Jurassic period left behind fossils when the Apennine Mountains were formed, almost 50 million years ago. During the 1950s and ’60s, the town made an effort to clean out the Ubaldini Palace, but the dungeon of the ancient structure remained closed even after it was restored. Then, in the 1980s, Apecchio hosted a truffle fair, and the dungeon was opened as an attraction for visitors. Not many people were interested in exploring the empty dungeon, so Bei proposed showing off some fossils. He set up a small table displaying a small part of his collection, and people became very interested. They wanted to see more. 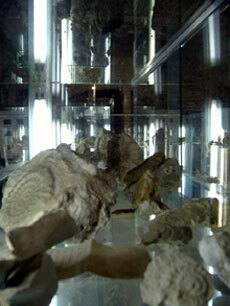 Now the Ubaldini dungeon is home to Bei’s complete collection, as well as fossils from around the world. Despite its small town location, the fossil museum has been visited by scientists from all over the world, comparing the fossils found in their respective nations to the ones found in Italy. Bei remembers a time when the town of Apecchio was skeptical of the impact the museum was making on the world of paleontology, but minds were soon changed when the museum began to attract experts. “In the beginning, Apecchio said we were the crazy ones who went up on the mountain to find stones that were without importance,” Bei recalls. “They said we would be better off searching for truffles because at least you can eat truffles…but as time went by they saw that scientists came here, that geologists and paleontologists came here to study. Unlike many of the foreign experts who have traveled to Apecchio, Bei did not study paleontology in school. His avid interest and knowledge of fossils was born out of a childhood love of nature and escalated as his findings were recognized as significant. He researched and taught himself paleontology while collecting what is now a huge library of paleontology reference books. 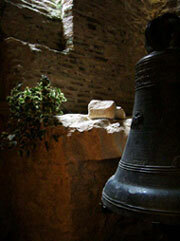 Apecchio is not the only place in Italy that boasts such historical gems. The country as a whole — already rich in history and culture — has recently dug further into its past to discover startling fossils that have had a profound impact on the world of paleontology. Scientists were baffled five years ago when an amateur paleontologist unearthed the completely intact remains of a baby dinosaur just north of Naples. This finding was especially exciting because the remains included pieces of soft tissue, which helped explain more about the true biology of dinosaurs. Many experts agree that this dinosaur, which they have named Scipionyx, can potentially disprove two very accepted theories about dinosaurs. The biology of Scipionyx creates a strong sense of doubt concerning what was thought to be a close ancestral relationship between dinosaurs and birds and also stirs doubts regarding the theory that dinosaurs were warm-blooded. Bei’s most prized fossil is a large crustacean called Hybopeltoceras. It is the most intact fossil in the museum. It also holds sentimental value for Bei because he spent a great deal of time cleaning out the intricate spirals that make up the fossil. He finds great satisfaction in his work, however difficult and miniscule it is, but is made even happier when others also appreciate his efforts. “In our town, there should also be something that gives Apecchio an importance. 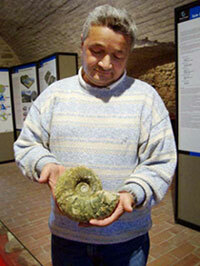 The fossil museum brings people here for reasons other than tourism,” said Apecchio resident Luciano Granci.